Forest Highlands is a luxury residential golf community, the only northern Arizona premier community with two championship golf courses. Perched on 1,100 rolling acres of Aspens and Ponderosa Pines, open meadowland with rich contrasts in topography an abundance of wildlife, there are approximately 830 home sites, and currently 750 homes within Forest Highlands. 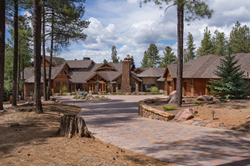 Flagstaff Real Estate Services has listed the “Crown Jewel” in the remarkable Forest Highlands golf community with astounding views. This custom-built estate, with 8,100 square feet inside and in excess of 12,500 square feet of covered living space, was designed by award winning architect, Daniel Eastburn of Design Barbarians Architecture of Arizona. Eastburn has won the Phoenix Home and Garden “Master of the Southwest for Architecture” in 2007 and designed the Phoenix Home and Garden “Idea House” in Talking Rock, Prescott, AZ, as well as the Crosswinds Presbyterian Church in Phoenix, AZ. Forest Highlands is one of the most sought after communities in the Flagstaff area. Just a two-hour drive from Scottsdale, it houses the world’s largest stand and Ponderosa Pines and offers an array of popular amenities including two championship level golf courses, two clubhouses, a fitness facility, a double-ended practice facility, a recreation center, and two swimming pools. It is a gated community with 24-hour security, 365 days per year and is a FireWise-certified community with a professionally manned fire station located on the property. Mary Mendoza and Jeanette Sauer are a group of expert Flagstaff Realtors for Russ Lyon Sotheby’s International Realty. Living in Flagstaff, Arizona, they are knowledgeable about all things related to Flagstaff and have over 35 combined years of experience in real estate. If you are interested in purchasing or selling a Second Home, Luxury Home within a Golf Community, Horse Property or Equestrian Estate be sure to utilize two of the most talented Flagstaff real estate professionals, Mary Mendoza and Jeanette Sauer.